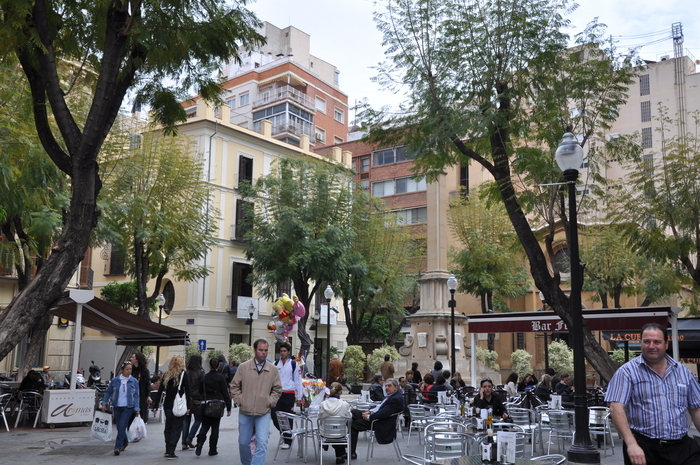 La Plaza de las Flores in the heart of the old quarter in Murcia City is one of the most singular and best known of the plazas in the urban shopping area of this capital city, popular with those who enjoy a tapa and a beer al fresco. This is a pedestrianized square with a central fountain, and is fringed with bars, shops, restaurants, and as its name (Plaza of flowers) suggests, florists, with free seating as well as that supplied by the hostelry sector. 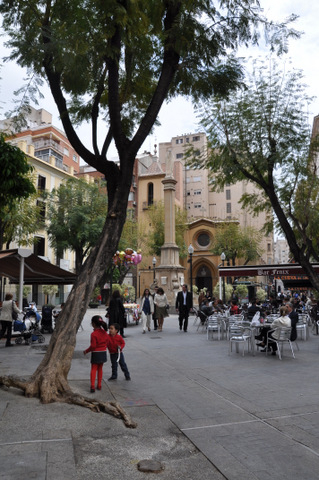 Although the plaza is very popular as a meeting point for Murcianos today, it has also played an important role in the history of the city, as it located inside the original Mediaeval wall which enclosed the Moorish Medina, and acted as a transit areas between two of the most important areas in the old city: the church and plaza of San Pedro and plaza of Santa Catalina. 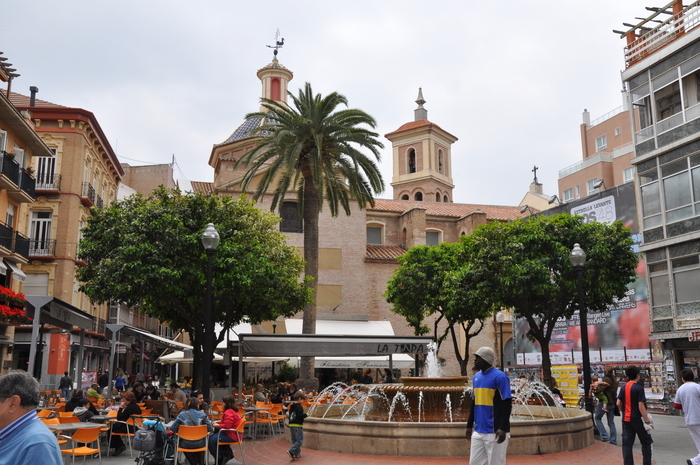 Santa Catalina was the most important plaza, or square, in the city for centuries, as all the main roads which lead to the major destinations of Mediaeval Murcia, namely Castille Y León, Andalucia and Cartagena, passed through the Plaza of San Pedro, alongside it. Until 1630 the area now covered by the plaza held the butchers’ quarters, with flowersellers behind them. The area was actually known as the butchers’ district until the beginning of the 20th century when it changed to Plaza Pedro Díaz Cassou, in honour of the Murcian writer of that name, although the area continued to be known by the locals as the plaza of flowers due to the location of several florists in the area. In 1968 the plaza was formally re-named as the Plaza de las Flores. This central plaza remains important in the daily cultural life of the city and is used for cultural events and concerts as well as being part of the route during the Semana Santa and Corpus Cristi processions. Streets leading off it include calles Jiménez Beaza, Ruiperez, San Joaquín, Arzobispo Simón López and Cristo de la Esperanza. In the Plaza de Santa Catalina which links seamlessly into Plaza Flores is the Museo Ramón Gaya, dedicated to the Murcian artist of that name.